People prepare for family emergencies in different ways. Some prepare for an earthquake, fire or natural disaster. Some prepare for financially difficult times and unemployment. Some just prepare meals in advance so that mom or dad is not too entirely stressed out at the end of a hard work day. Whatever your reason for preparing convenience meals, this is a simple method of keeping track of what you have on hand and keeping it an organized location. This method is one anybody can use. I don't claim the method of planning a menu this way to be mine, but doing so based on meals in a jar...that idea is my brainchild. Period. It was never done until I showed it here. I also claim these recipes as ones I have developed through personal trial and error. We've heard it called a "year's supply" of food. Ensuring that should anything catastrophic happen, your family will be fed. I am not a "Doomsday" person. I am, however, all about expecting the best and preparing for the worst. For the most part, these meals have been used for emergencies like "Tuesday night". Ironically, they have also seen us through some tough times financially when we didn't have work. Do with them what you will. Recently someone asked me to write down a few of my recipes for long-term storage and what I recommended. I have a method that I like to recommend to those starting out on food storage use that isn't new, but it was a little bit exciting when I heard it. One plans 7 meals, one for each night of the week and then figured getting 52 of each meal. Boom! A year's supply made simple. My method of containing each meal entirely in ONE jar is different than others who have planned the meal in a 52-week method but didn't keep it this simple or concise. I wanted it all in one spot. In this way one would easily be able to have a year's supply of food that a family of four would eat should they need it. One wouldn't have to search through things to find the corresponding can of meat or sauce to go with the starch. It sounds "simple stupid"...but sometimes that's how I roll. It's a good simple way to calculate a family's needs. It's also a good way to get back to the basics of what a normal family will eat. Without getting into a lot of canning details and crazy stuff here, I do want to say that I don't want anyone to have to worry about "wet pack" canning meat or rotating cans of beans and vegetables. This gets into methods of pressure canning that some may not be prepared to practice proper rotation or sanitation while home canning. No, the wet-pack are not safe on the shelf longer than one year**. PERIOD. (Please see Home Canning Safety 101 for specific details in this matter)**The one-year time limit is only for food that is wet packed! Dry ingredients that are vacuum-packed can be good up to 10 years or MORE depending on the meal. For me, even though I pressure can wet food, I've found that buying freeze-dried vegetables and meats has been a much better approach for our family. I've done both and this is much easier for longer term (5 or more years). Freeze Dried vegetables cost more initially, so if you want to use your own dehydrated from your garden it's up to you. They must be completely bone dry in order to work. We grow a lot of our own stuff but I have not made these recipes using those because it's harder to get a measurable consistent product for everyone across the country. If you use your own dehydrated, you will have to figure out how much moisture to use and how long to cook things. I also use no msg bullions and yes, I do use a powdered cheese sauce mix here for convenience and consistency of flavor. It's got added colors. If you want to make your own organic cheese sauce mix see my post here. If you want to go totally vegetarian, and don't want to use the soy TVP, you can use dehydrated or freeze-dried zucchini in place of the meat. Freeze dried vegetables that I use do not have any chemical processing done to them. They are all-natural and 97% of the nutritional value is retained. Dehydrated food retains about 92% of its nutritional value. Not all food storage companies are the same, for this reason, if I have a link that is brand specific, it's because I know that company doesn't add anything to the meats and vegetables in its freeze-drying process or any sugar or chemical coating. The new technology available has even made it possible for beans to be "instant" cook! If you use the freeze-dried meat, you will need to use the oxygen packets and prepare the jars the same day you open the freeze-dried meat so it is safe to repack if it is done within 2 days of opening the can. That being said, here are 7 of my favorite quart size jar recipes that are easily used for everyday or for long-term emergency food storage. Enjoy. Share these recipes with your friend! Get the word out that they are here! PLEASE...make sure my name stays with the recipes. Try to think how it would feel if you had worked on the recipes yourself. You'd want not only the credit but also a way for people to contact you if they had questions. I ask you to please be mindful of that. Thanks. You will be using a method some have called "dry pack canning" but it's actually called Vacuum packing. No liquid or pressure canning is necessary. If you opt to use the freeze dried meat in the recipes, please note: NOTE: The repacking of Freeze Dried Meat must be done within 24-48 hours of opening the can and must be done in a dry environment. Once repacked you must use an oxygen absorber to make sure there is a vacuum oxygen-free environment. This is a great meal made completely out of food storage. It's amazing for camping or dinner any night of the week. It's perfect for giving to a sick neighbor or to someone you actually...like. I think my family likes it because the folks I cook for are down-home-raised-on-the-farm kind of people. They don't like a lot of green herbs and junk in their food (ironic isn't it?). Now and then I get "froofy" chef on them and roast some garlic or chop some tarragon, but for the most part, it's "regular people" food. As for this meal, the crazy cool part is that it fits in a convenient size quart jar for easy food storage space and planning! Please note...After many loyal years as a chef and customer for Honeyville Foods, writing their company cookbooks and promoting their brand. I've found something I consider a far superior product line and I'm okay admitting that! My little family does and did rely on the royalty money we did receive from said previous employer to pay much of our family expenses. I was forbidden by contract to mention any competitor of their brand until recently. That job loss has been sorely felt and I've suffered many hardships. After 4 years of no longer being their chef and having to work on a shoestring budget, I'm ready to move on. I've become an independent sales consultant for a company in Utah called Thrive Life. That happened November 14th, 2017 . I've secretly been purchasing Thrive products for the last several years and have actually found their quality to be incredible. This is the brand I suggest for making these meals now that I have the option to admit it! Again, the sales of freeze-dried products from my website is a huge blessing to my family and will be to yours. I give out the recipes here as a service. If you do share them, please give full credit to this site. To do otherwise would be stealing from my children. I don't appreciate that kind of stinkiness. Thank you so much! Onward an upward! When you get to the tomato powder, just shake the jar so it works its way through the cracks. To prepare, Taco Soup: place contents of jar in a gallon pot in a solar oven or on the stove. Add 2 quarts of water and simmer 20-30 minutes until veggies are tender. Serve with nacho chips, sour cream and salsa if desired. Conventional Bag Mix preparation Directions: Brown one pound of hamburger in a large skillet. When hamburger is browned, I add 1 cup hot water and 1 1/2 cup milk or soy milk. Bring to a boil and cover. Simmer 8-10 minutes until noodles are tender. The sauce will thicken a little more as it cools. Jar directions To prepare Cheeseburger Skillet Meal: Rehydrate meat with 1 ½ cups hot water, drain. Place in hot skillet. When hamburger is browned, I add 1 cup hot water and 1 1/2 cup milk or soy milk. Bring to a boil and cover. Simmer 8-10 minutes until noodles are tender. The sauce will thicken a little more as it cools. In a bowl Rehydrate hamburger in 1 ½ cup hot water. Drain. Place in a skillet. Cook over high, and add gravy mix, noodles, water, and milk. Simmer 8-10 minutes, stirring once or twice, but covering each time. When noodles are a tender season with additional salt and pepper if needed. In a quart jar place 2 cups radiator noodles. Put an oxygen packet in jar and seal. Directions for Turkey Noodle Casserole: Carefully remove the bag. Put contents of the bag in a 2-quart saucepan and bring to a boil. Boil 5 minutes. Cover and turn off heat. While sauce is cooking bring a gallon of water to a boil, cook pasta 10-12 minutes. When tender, drain. Stir into sauce mixture. Pour into casserole dish and top with additional cheese if desired. Remove oxygen packet and discard. Open the bag, carefully ease contents into a quart saucepan and add 2 cups water. Bring to a boil and reduce heat. Simmer 5-6 minutes. Turn off heat and let sit 5-6 minutes. While sauce is cooking, place rice in a quart size pot with a tight-fitting lid. Add 4 cups boiling water or chicken stock. Cook on lowest heat 17-20 minutes covered until rice is tender. Spoon broccoli cheese sauce over rice and enjoy. In a large skillet, combine contents of jar with 3 ½ cups hot water over high heat and bring to a boil. Reduce heat and simmer 10-12 minutes stirring every few minutes. Turn off heat and let sit 3-5 minutes. I try to make New Meal in a Jar recipes as often as possible and I'm adding more all the time. The Meal in a Jar Handbook is available on Amazon and it has over 150 similar recipes. YES, this information is copywrite protected. Share it, but my information MUST remain with all copies. If you choose to pin it on Pinterest, PLEASE don't just post the recipe on your pin. Let's be fair and let people actually get all the information they need from the actual post here. Please know that I don't have a staff. I'm a full-time wife, mom and have a full-time job. I am the sole breadwinner for my family. If I don't return your emails immediately, it's not personal. I love you. I'll try to answer if I can. These meals can be made more sustainable if you use your own dehydrated vegetables and organics. The freeze-dried vegetables I use are non-GMO and 100% natural. If you use your own dehydrated vegetables, YOU will have to figure out how much water to add to your meals and how long to cook them. I can't regulate how large your vegetables are cut or how dry they have been. They must be absolutely dry to use in long-term storage. I have to make these as accessible as I can to many people. These usually feed our family of 4 adults and 2 children and have a little left over. I'm working on the nutritional information for each one and will get it posted as soon as I can. In the meantime, thank you for your patience. Continue reading a lot of the other follow-up posts to this one. I answer a lot of questions throughout. These are meals that have worked for US. They are suggestions. Try a few recipes at a time and see if you like them. I UNDER season these, as we have people in my home who do not like a lot of seasoning (geriatric diets) so they are a little blander than I normally cook. You will need to see if they are seasoned to your family's taste. End Note: In case you missed it...After many loyal years as a chef and customer for Honeyville Foods, writing their company cookbooks and promoting their brand, I've found something I consider a far superior product line and I'm okay admitting that! My little family did rely on the royalty money we received from said previous employer to pay much of our family expenses. I was forbidden by contract to mention any competitor of their brand until recently. That job loss has been sorely felt and I've suffered many hardships. After 4 years of no longer being their chef and having to work on a shoestring budget, I'm ready to move on. I've become an independent sales consultant for a company in Utah called Thrive Life. That happened November 14th, 2017 . I've secretly been purchasing Thrive products for the last several years and have actually found their quality to be incredible. This recipe doesn't say how much water to put in the pan with the jar ingredients to boil for 5 minutes. Thank you Thank you for bringing that to my attention! Oh wow! It's 2 1/2 cups water for the sauce on the turkey noodle casserole. I had to look on one of my jars. It wasn't anywhere else. I know you can't order the sweet potatoes on line since they are a very new product. I'd suggest using Freeze dried zucchini in it's place Or order Freeze dried potatoes from THRIVE online. They have them but Honeyville doesn't. If you send me your email (chef-tess@hotmail.com) I'd be happy to send you the printable PDF Of these recipes. OR Fox 10 will be posting the printable version on MyFoxPhoenix.com Tomorrow after my segment with them on the convenience meals. You are awesome! I can't wait to buy everything. I really want the sweet potaotes. Those are a favorite in our home. Instead of an oxygen packet, could you use a food saver attachment that removes the air from jars? Yes! The foodsaver jar attachment works great! If you use it, be sure to put a coffee filter cut to the size of the top of the jar (or I use a cupcake liner) just so any dry debris doesn't get caught in the vacuum. Can you use Mylar bags instead of the jars? Yes. Mylar bags will work. Shelf life is 4-5 years with those. I am TRYING to purchase the Yummie's cookbook but so far I can not seem to find it anywhere. When I click on the electronic version it immediately goes to a site that lets me know there is no such thing. Even tried the Preparing Wisely website. Also can't find instant beans on the Honeyville site. So sorry. We had some technical issues with the online version of the book that we're trying to work out right now. So far http://www.preparednessdeals.com/servlet/the-Cooking-Supplies/Categories is the only place right now to get the books unless you're local in Arizona and Preparing Wisely carries them in the store. Honeyville's new quick cook beans are only available now at the retail locations, but will be available in about 2 weeks on the online store. THRIVE (Shelf Reliance) has a similar product called Instant beans. Those are available now on their website. They work for the beans. You can get long term storage dehydrated sweet potato from Pleasant Hill Grain. I've used the Thrive dehydrated sweet potatoes in place of the regular dehydrated potatoes and loved them. Thank you for sharing an additional source for those! Xoxo!! After hearing about this method in class I have finally come back and read about it on your blog. I am very excited. Of course, it will be a slow process, but I'll start now. Thank you. if you vaccum seal the mylar bags shouldn't they last just as long as a jar would? It seems smarter to use a mylar bag in case an earthquake hit, and how much room they save while storing them. You can use mylar, but they are plastic and as such they will still not have the shelf life that glass will. I have not, like I say, tested the mylar extensively. I have jar meals that are 7 years old that are still great. I will have to research more on the mylar. Vaccum on those should be fine. Vaccum on the Foodsaver bags that are not mylar are not recommended. For those worried about glass in an earthquake, slip tube socks over the gars. (Just save your hubbies socks when they get holes in them.) 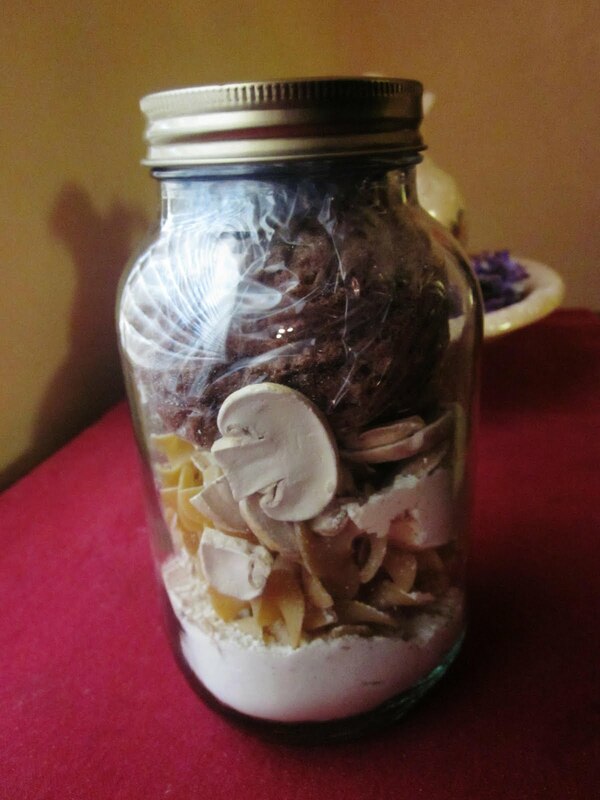 It will also help if you can store the jars in a place they can't fall from. I am thinking roll out drawers under the beds would be great! You should be working for NASA. I'm not kidding. Making healthy, edible, delicious meals that are transportable and edible in space is one of the biggest challenges to getting to Mars. Read Mary Roach's book "Packing for Mars" if you don't believe me. For real. You should call NASA. Just found your blog and I find it very interesting. Some great ideas here, but unfortunately, not much use to me. Do you have any recipes that are sustainable? Nearly everything you have here requires store bought inputs. Why freeze dried corn when you could use home grown dried corn? Also, lots of your recipes use soy things (terrible for your health), bullion (delicious, but most are full of MSG and other nasties) and misc. mixes. An example is Honeyville's freeze dried cheese powder. Aside from yet another item that must be purchased, did you take a moment to glance at the ingredient list? There were at least 4 different chemical color additives alone. I would never opt to put something like that in my body, let alone purchase something like that to store long term for my family. How about some recipes that don't require breaking the bank to make them? If one has to buy all these ingredients to make these quick meals, you might as well just buy canned ravioli and chicken noodle soup and be done with it. I updated the post above to make sure your question was answered. YES I use consistent Freeze dried products. It's the only way I can make sure that the recipes are consistent. You can grow your own, dehydrate it, use non-soy, make the cheese sauce from scratch (I give the link to my organic recipe) and do whatever you want. These are suggested recipes. Bottom line...I'm doing the best I can to make these healthy. Freeze dried vegetables retain 97% of their nutritional value and do so for long term storage. Honeyville's are non-gmo and nothing added. JUST the vegetable or fruit. If you don't want to use something, you don't have to do so. We grow a lot of our own vegetables, use a solar oven, cook and use whole grain and organic stuff. God bless! Have a great day!! Also...if you look at the rest of my blog, you'll notice how many hundreds of recipes and posts I have for from scratch sustainable natural foods. I support local organic farming. I'm very aware. This is only one post. There are tons of ideas here for all walks of life. Scroll down to the "homemade" section and see. Dear anonymous... Why criticize!? If you don't like the recipes... DON'T USE THEM! Get something better to do than criticize this awesome lady and her blog! I find her recipes and ideas wonderful! And I'm willing to bet you dollars to doughnuts if we were in an emergency situation you would be THRILLED to have ANYTHING to eat! All this is is a guide! I for one am VERY EXCITED to have these ideas! Quit being such a pessimist! Thank you. Xoxo! I do try. I am so excited to find these...I am thinking that this might be great for camping too...I'm also going to pass on the link to our church's young women's leader for their summer girls camp meal planning. I love this site! Thank you for all you do! The jar works like a #10 can but is a more family friendly size. Yes you can double or triple and put in a #10 can, but that would probably be about 20 servings. I haven't done that yet. Dry pack with jars is, again, essentially what the cans do, you just don't need to have a machine that works tha cans and a huge amount of food in one can. I am really excited to try all of these recipes! Do you have an estimate of what each jar meal costs when you use the Honeyville Farms dehydrated ingredients? Just curious. Love you!!!! Chef Tess - Thank you for the great recipes. Have you completed the cookbook for jar meals? Getting ready to order supplies and would like a little more variety. Wanbergs...the meals cost between 6 and 8 $ a meal for a full family meal that is shelf stable 5-7years. The cookbook isn't done yet, but we're getting there. If you scroll through the rest of the 52 method section, you'll find A LOT more posts. What size oxygen absorber do you use in the quart jar? In the introduction, you say that the jar meals are shelf stable for one year period. Then in the comments section, you say they are good for 5-7 years. I'm not understanding the information. Could you please clarify? Maria, the boiling water bath and the pressure cooked "wet" packed foods are shelf stable one year. DRY pack is a different method completely. This is why the dry food is safe 5-7 years as long as an oxygen free environment is achieved. The oxygen absorbers I use are the 300 cc. Those will absorb up to a gallon of oxygen and will ensure the space is safe. It will depend on how much has settled during shipping, but for me it's usually 10-12 meals per #10 can if the measured need is 1 cup. Like I say, it will depend on the settling. I just made the stew today using diced beef instead and I'm using that forever. It was so good! Yes. I've found that to be a pretty close number for most of the recipes. More if it calls for less than a cup per jar. I don't know if you could be guaranteeing a 25 year shelf life. They can't even do that with metal cans, and I've talked with a lot of food science people here. This is why I generally say 7-10 years max. Especially with the spices and things, the flavors would be really off. Just found your site, amazing and so wonderful that you are willing to share all your hard work. I can't wait to try these. Wish you were my neighbor. LOL Not too many people in my area that live and think like this. I grow (organic), dehydrate, can etc. It's the only way I can afford and be assured of pure healthy food. Thank you for sharing! I am allergic to milk products and also soy. So, any ideas on what I can use in their place? There are a lot more choices for dairy free/soy free in the recipes that follow. I've yet to find an almond milk or rice milk powder that I like for these meals for the creamy sauces. Keep reading in the follow up posts though because there are a few more dairy free choices with the oriental dishes and the Yankee Pot roast gravy over mashed potatoes (use the potato flakes). The chili recipes are dairy free and (use the meat instead of the soy TVP). oI am sooo excited to have found you! This sounds like a great way to get some food storage going! The anonymous post you got on March 2 should be ashamed of themselves. Here you are, trying to help people, and all that anonymous person could do was pick you apart. Good for you for holding your ground. I for one cheer you, and cannot wait for the cookbook! Thank you! You have no idea how much I needed that cheer of support today. Thank you my friend! A millions thanks Chef Tess. Your site is awesome and I can't wait to get started putting up some of your meal-in-a-jar recipes. I have been into food storage for about 6 months and I like the idea of making family size portions in the glass jars and also using these for gift giving. Please don't stop doing what you do! when you say seal the jars, so you just mean screw the lids on tight, with the moisture absorbing packets in place or do you need to do something more? Yes, screw the lids on tightly with the Oxygen absorber in the jar, making sure it is deep enough to not overlap the rim and prevent a complete seal. I don't heat the lids, as this sometimes causes condensation and the moisture inside the lid can cause growth of bacteria. Chef Tess, what a Blessing your blog has been to me and my family!!! Thank You!!! If i open the freeze dried meat and dont use all of it in your awesome recipes can I 1. pack it in a jar with an oxygen absorber to use later? and 2. When i open the jar do I need to use a new oxygen absorber to reseal it? Thanks in advance for your answer and God Bless. Oh thank you for your sweet comment. Yes you can re-pack the meat into mason jars. Yes you need to use a fresh oxygen absorber once they are opened. Thank you for the words of love and encouragement. Xoxo! Where do I find msg free boullion? What brand do you use? I would love to know. Also, is that true that pressure cooked chicken or beef only has a 1 year shelf life? Thanks for blessing the lives of so many! Yes! Most of them will store 5-7 years depending on the recipe. Look for the later post on the gravy/cream-o-soup mix and it gives some newer recipes and how I do it for long-term. It's fun! Xoxo. Thanks for the love my friend. Can I use the same concept to jar up some breakfast meals? I was thinking of putting bacon, ham or sausage in the bottom, then eggs, onions, bell peppers, and mushrooms. What do you think? We do baggies with individual omlet ingredients in each in a baggie in a jar. The only change I'd suggest is not using the TVP bacon. It will go pink. I've tried all the different brands for that and it's pretty universally true. Real bacon won't have a long-term shelf life. Freeze Dried sausage is awesome here. So are FD potatoes and sweet potatoes. I've done breakfast skillet meals, several in the book upcoming that I am not publishing on the blog. The publisher wanted a few things in the book that were not on my blog...for obvious reasons. There are a ton of breakfast applications for this! Go for it!! Crow's nest, the Honeyville Retail stores carry the half gallon jars. I also recently learned from the BYU food science department that the PET containers can be used for longer-term storage on these ONLY if you use the METAL lid with the rubber gasket. So...those are a big option as well. Thank you for the love my dear! Hope do you prepare the jars and lids beforehand? Wash and sterilize jars and lids in the dishwasher. Allow to air dry completely. Chef Tess, I love the idea of these. We just put in an 10x16 storage shed so I will have somewhere to store these. I just need to know who many servings are in one of these jars? I have a family of 5. We have a family of 6 and they usually feed all of us. Keeping in mind that I'm sharing what has worked for us. I have two children and 4 adults here, so your numbers may be different. If in doubt, make a recipe first and see how many servings your family will eat. Sometimes a portion to use is ridiculously large for your family...or small...if you have large teenage boys. So I see that you just put ingredients into jar, place oxygen packet in, and tighten the lid down to seal. How does that seal? I guess I'm confused. I thought the rubber had to be heated. Do you ever have trouble with jars sealing? When I read the recipes, I assumed that you must put the lids on and then place the jars into a hot oven for about 20 minutes. This is how my mother cans dry things like oatmeal. So much love to you! We just went through a small weather emergency here in Columbus, OH and I wish I had had the foresight to do something like this. For emergencies AND "Tuesday nights." :) Thank you, thank you! dlsully, you don't heat the jars or lids. If anything that would cause condensation from the heat inside the jar and you don't want any moisture. The oxygen absorber causes a vacuum inside the jar. It's a safe method. @Amy...You're most welcome.Xoxo! Great ideas here. I love Mason jars for storing my bulk grains, and your idea for the complete meal in a jar mix is another great thing to store in the mason jar. Some people are asking about storing in Mylar bags, and the first thing I think of is, no matter what shelf life you predict - what about nibbling vermin (e.g., mice). I'd think a mouse could cause all kinds of havoc with the Mylar - and that would definitely defeat the purpose! Great idea for 'earthquake proofing' the jars (the person who said 'tube socks'). I have also seen someone attach bungie cords in front of shallow shelves, to keep jars (or other items) from vibrating off of the shelf. Nice work, and I hope you do look into the Mars suggestion that someone else posted. Sheets of bubble wrap, like used in shipping, can be cut to fit around the jars to protect them in an earthquake. Ace Hardware carries the 1/2 gallon canning jars. They were the least expensive that I have found, plus the shipping if free if you choose to pick them up at the store. I have a suggestion to keep the mylar bags "vermin" safe. Place the bags into a 5 gallon food grade bucket. Chef Tess, keep up the good work! God Bless you! Can Thrive Cooked Ground Beef (freeze dried) be used in the Saucy "Baked" Ziti with Sausage and Mushroom instead of the Honeyville freeze dried hamburger? Ace is the place! Grin. Um...yes you can use the Thrive ground beef. It works pretty well in the meals. It won't work for the meatballs and meatloaf, but it will work for these meals. I'm new to preparing, canning, dehydrating, etc so forgive me if this is a silly question. If I am using my own dehydrated meat for these meals, would I cook the ground beef first or dehydrate it raw? Thank you so much for your blog! I couldn't have found this at a better time! Looking forward to the recipe book! Kel, I don't dehydrate my own meat. I'm sorry I don't know what to tell you there. I feel much safer using meat that has been commercially done or using a vegetarian alternative. I have found Powdered Coconut Milk to be a good dairy/soy replacement in many recipes, in addition providing authentic flavor to Thai and Indian recipes. I've tried both the King Arthur Flour and Wilderness Family Naturals brands and both worked extremely well. There is just a bare hint of coconut flavor, but nothing more obvious than almond or rice milk; certainly palatable enough for even cold cereal. Our first taste of the meals we put together will be tonight. I think this idea is brilliant, thank you for developing them and sharing all your knowledge with us! I thought I read everything beforehand but maybe I missed it. It seems like they only fit into wide mouth quart jars. The regular ones were impossible or very difficult to fit everything. Also couldn't find quick cook white navy beans, green chiles or lime juice powder at honeyville, preparing wisely or food wise. Any suggestions of where to get them? I'm so thrilled to have found your site today. Since some of your recipes call for storing items in a baggie inside of the jar...do you use ziplocs or just small sandwich bags. Another related question is if I use a Ziploc will the oxygen absorber still be effective on the inside baggie? Thanks in advance! Yes. It will still be effective. You just need to leave the baggies unzipped. I use them to keep food separated. It will be fine. Wow this is really great. I'm new to canning but I love it and this is another idea for me to try. I will def have to have the book. Can't wait to try some of these. Thanks. Wow! I love this! Such a great idea! Thank you Chef Tess, glad to have found your site! Several of us in the family have Celiac Disease. So, I have 2 questions, please. 1. Are the dehydrated meats gluten-free? 2. Is it okay to substitute rice or corn noodles for the wheat-based noodles in the recipes which contain noodles? 1) Could I re-purpose some of my other containers (like formula containers) to store the recipes in (if I use an oxygen absorber) or do I need to use the mason jars? You seem to be more of an expert on the safety of food preparation/storage. Are these sources correct, or are they totally wrong? The freeze dried meats are gluten free. They are just meat. TVP you'd have to check specifically. I don't believe they are. I'd have to look at the formula containers for repurposing. I'd assume they are not able to be re-used if they are the metal/cardboard containers with the plastic lid. The homemade freeze-dried foods are something I'd have to look into. I haven't done any of that at home. Dehydration at home is possible for fruits and vegetables. The meat would be a jerky and not something for long-term storage. In the case of home freeze-dry if they aren't using an industrial machine I don't know how they are able to guaruntee the safety of the food. Again, I'll have to look at the links. Would it be possible to try the recipes with fresh food to make sure my family likes them before investing in all the freeze dried ingredients? What kind of conversions would I need to use, do you think? I'm sorry, I haven't done the recipes from fresh and converted to freeze-dried. I started the other direction for most of them, with a few exceptions being family meals I knew we loved and converted the base recipe to be as similar as possible. For the most part, dehydrated will take 2X the water to hydrate as freeze-dried on the vegetables. Meat will vary from company to company dependion on the cut and composition of the products. Does Honeyville host "parties" where people can pay a fee and assemble these jars with friends? I would like to make only a few until I know I like it, but it's a big initial cost. Where do you purchase the oxygen packs? Did I also read correctly that if you have a food saver vacuum jar thinger, that you don't need the oxygen pack? Honeyville doesn't host parties to make them, but you can get in on it with a few friends on your own. Count on the meat making about 10-11 meals if the recipe calls for 1 cup of meat. The meatless ones cost a lot less. My personal favorites are the taco soup, chili and baked ziti (there are a lot more recipes than what are on this post). Feel free to e-mail me (chef-tess@hotmail.com) and I can get you an updated pdf of the most popular recipes. Dehyrated/dried lemon, lime, and orange powder can be found at truelemon.com. 100%natural! Some Winn Dixies in the south are carrying the lemon powder now, but not the lime or orange. Wanted to know if you can dehydrate your own meat & vegetables to use instead of having to buy the freeze dried. Vegetables yes, but you'll have to adjust the water on dehydrated vegetables depending on the size of the pieces. Meat, I haven't found a freeze-dryer that would be less than several thousand dollars. Not in my budget to do that at home yet! Dehydrated meats (like jerky) don't have a long shelf-life at all. I haven't found a safe way to do those. You are a god-send. I was in a quandary about which way to go in storing our food for long term storage. Your idea is so right for us. We're vegetarians and I wondered if we can still use the recipes excluding the meat. What can we use in it's place as I don't want soy or mushrooms. Is there anything we can use across the board for most of the meals? You can use the vegetable tvp however I've found we like the freeze dried zucchini in place of chicken in the recipes as well as freeze dried mushrooms. I am somewhat new here and wondered if your tutorial book is available now. I am aware of the Yummies book, and I see the other book advertised, but do not see it at the preparedness deals website. A big thank you for all you're doing. I'm working on getting the e-book version of the tutorial cookbook to Preparedness deals. It will be available soon, but it is not the meal in a jar cookbook. It is a compilation of the Tuesday Tutorials from this blog. Hi Tess, great site. If I was to start with one or two meals, which ones would have the cheaper ingredients to start with? I am absolutely LOVING your blog. Thank you so much for all that you do. Being prepared for ANYTHING has never crossed my mind until now. If we had an earthquake, tornado or anything, my family would not be prepared :(. So, thank you. I do have a few questions...I am curious to know how long you have been doing this and what gave you the idea? Ah. You're so sweet! Thank you! I've been doing the meals about 6 years now. Initially the idea started as I was just wanting to be a little more prepared and not wanting to have to search our little apartment for where I put the ingredients. This is actually just the "brain-child" of my disorganization in my pantry...Scary isn't it? I just found your blog and want to shout out a big thank you for these wonderful recipes. I saw your peanut butter Thai recipe on Honeyville and had to google you & woo I'm glad I did. Hi Chef Tess! You've got a truly awesome blog and I really respect what you do. I live in Hawaii, so being prepared with extra, long lasting food is a pretty big deal (a lot of people think it's doomsday thinking, but you never know when we'll have another island-wide blackout or dock workers strike...). Anyway, I just started looking into the meals-in-a-jar concept, and I was wondering, how do you prepare your jars? I couldn't really find anything in your posts. I read in various places on the net that mason jars should be boiled or run through a sterilizer setting on a dishwasher before canning, but they were all in relation to wet foods. I assume this is still a good idea for dry foods, but I wasn't sure if it was necessary. Do you have any advice? I don't have a dishwasher, so I'd have to boil my jars in a pot if that's the case. I sterilize the jars (dishwasher or solar oven dry for 10 minutes at 210 plus degrees). Make sure jars are bone dry when you make the meals but yes, it is a good idea to sterilize jars. :) Great question! Sorry, just as a follow up question, does the sterilization have to be in a boiling water bath? Since you mentioned the solar oven dry, is it possible to just bake the jars at the 210+ in a regular oven and still have them be sterilized? I only ask because the biggest pot my family has is exactly as tall as the quart jars I have. Yes. You can do so in the oven, but don't get them over 250 degrees. The bottles may crack at higher temperatures. My concern is being able to figure out how to make enough jars that I use up all the freeze-dried containers so that I don't waste any. (You said that meat should be used within a week of being opened--what about the other ingredients?) It seems a logistical nightmare to me to figure out how many recipes I can make without wasting expensive food. Am I over-thinking or missing something here? Count on the meat making about 10-11 meals if the recipe calls for 1 cup of meat. The meatless ones cost a lot less. You can see the nutritional information listed on each can and it will give you a good idea of how much each can will make. The dry measure has been pretty accurate on all of the ones I've tried. For the most part, the rest of the food will last up to a full year without being in an oxygen free environment as long as the lid is on them and they are kept dry. I'm seeing the meals making between 15-25 meals per can on the veggies, again, depending on how much is called for in a recipe. Question: I know you work to ensure the ingredients are natural and non-GMO; but unless the TVP is organic, isn't it a GMO food since 90% of conventionally-grown soybeans are genetically-modified? Correct. If you use the meat is it non-gmo. If you use the TVP there's really no guarantee. Assuming you use lids and rings on the jars, do the oxygen absorbers create a vacuum seal? Can the lids be reused for canning? could you write your book in spanish too?? I'm not sure about Spanish. I'll see what I can do, but I'm not making any promises. Thank you for being so excited and sweet! Much love!! The lids do form a vacuum seal. They can only be re-used for canning from dry vacuum packing to regular canning but not using a used lid from wet canning to dry packing. The heat on the ring of the lid will be the main factor for that. The items in the bags are usually ones that have a totally different cooking time or application. Read further into the other recipes for meals in a jar and I explain it. If I don't use an oxygen absorber or a food saver machine how long will a jar of the food last? If you use the real meat that would be a big problem to not use the foodsaver or oxygen absorbers. Please read the tab at the top on the 52 method for more details and frequently asked questions. When making these jars, can you use regular store pasta and spices or do you need to use types that have a longer shelf life? Regular store pasta will work and as long as the spices are really fresh, you should be okay. I have made all of the 7 day menu meals, the only one my family does not like is the stroganoff skillet. It is really bland is there a way to doctor it up after I have sealed them all? Yes, I've found the addition of 1-2 tsp of vinegar powder to really add a bit more zing to that one. I get that at firehousepantrystore.com and they ship really fast. Chef Tess I know you said that you can put jars in the oven at 210 degrees to sterilize them, can I also put the rings and lids in the oven too? This is fantastic. Thanks for this. I've been ordering Thrive freeze dried foods and I'm really looking forward to putting some of these meals together. Thanks so much! Oxygen absorbers are designed to absorb oxygen, not air, so if you where sure that they were fresh, even if the jar doesn't seem sealed you should be fine. Just make sure the absorber wasn't over the lip of the jar between the lid and the ring. If you used the meat, reseal as soon as you can with a new absorber. Make sure it is as tight closed as you can get it. Up to a week is the recommended re-pack time. If you're much over that, I'd suggest re-making them or transfering the ones you'r worried about to the fridge or freezer. Use within a month in the fridge or up to a year in the freezer. RE: protection from earthquakes (or rampaging toddlers), if you buy your mason jars new, keep the box and internal dividers. They are proven protectors. List the meals on the outside of the box. It would be smart to write it on the top of each jar, too, so that you don't have to search for the meal jar you want. I use Scotch Magic Tape for labels like that...it's clear, stays stuck, but can be removed much more easily than paper or address labels. Oh, and I also wanted to thank you, Chef Tess, for all your great work and generosity! My husband and I sell Thrive food, and love it, but I'm so glad to know about Honeyville, too. Neither company has everything, but they can each fill in the holes for the other. The important thing is that good food from a reliable, ethical source is available! :). Thanks so much. You are a real blessing! Hi and thank you Chef Tess. We have had the not so wonderful floods here in Colorado. Wish I knew about your meal in a jar recipes sooner although this disaster we were aptly prepared. To make these meals for two senior ladies as gifts,would you suggest breaking the recipes down to pint sized jars? Thank you again, love your videos, you re great. God bless! Ps what is the most economical way to purchase the bulk of the ingredients for the 52 jar recipes? As I was scrolling through the comments, I noticed that you said you don't recommend Food Saver type bags. I want to use these recipes to give as home made gifts (dry ingredients in a jar)and they will be used relatively soon after giving them. Why do you recommend not using that type of bag? Would the bags be okay for short term storage/what I have in mind? Thank you. The food saver bags are not made for long-term storage and are not suitable for the real meat if they will be at room temperature for more than a week (max!). If your are making only the vegetable/powdered part of the meal and adding the meat later, then the food saver bags can be used. The real freeze-dried meat is the issue on the packing. It must be in an oxygen-free environement that can only be provided by the mylar bag or the jars. 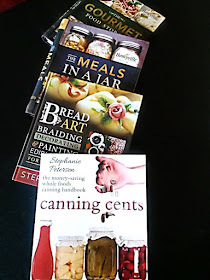 If you need more information on packing them in the mylar bags, there is a tab at the top of the blog that will open a page full of links for the meals in a jar. Xoxo! Love you!! This is an awesome website! Thank you so much! I am not able to see pictures of about 3 of the recipes on this page. It looks like the photo-hosting site is closed. Wasn't sure you were aware of this. I'm hoping to check back later to see photos... the recipes sound awesome! Tess,I love your blog and recipes. I recently found mylar bags that have a zip lock top. What would be the benefit to having these verses the sealed ones? Just received your "Meals in a Jar". So excited to try some new recipes, especially the Single Meals. Question: Where oh where can I find plastic PETE containers with the gasket lids? Keep 'em comin', Kiddo!! Hi Tess, I'm so excited that I found your blog! I have been searching for meals like yours for such a long time. I will definitely be making as many of your recipes as I can! Besides, the regular Meals-In-A-Jar and the use of Mylar bags, I would like to know if you have any recipes for adding hot and/or boiling water to the Mylar bags. A am a Flight Attendant and have gone many times without having a nice meal to eat. On the aircraft and at the overnight hotels, I only have access to boiling water. If this can be done...it would be a total game changer!! Thank you so much for all the hard work that you have done to create a safe and healthy meal prep! Thank you so much! My best friend is about to have baby #3 and I want to make some pre prepared meals, but they have a tiny freezer so the usual options are out. I have searched the internet high and low for something like this and had given up when I stumbled upon your blog on pinterest! You have no idea what a blessing this is! In some of the recipes like Hamburger Stew you mention cooking in a solar oven for 1hour. If using a conventional oven is there a generic temp I can use like 350 or 375? Thanks. my church is looking to provide a whit box alcohol stove with some single serve mixes for a 72 hour kit. Do you have any ideas on which recipes would be good for this type of a project? Suggestions on what to include? I have found a few locations that sell the pete lids. Look for them online. In the posting for personal sized meals it breaks it down for smaller portion size. You can also divide the family sized meals into 1/5 or 1/4 depending on how hefty of a portion you want. The zip keeps the food inside when you seal the edge. I really like that. Can I use regular flour and pasta from the store, or is special honeyville products needed? Thanks cheff tess! I can't wait to start preparing! Yes. You can also use regular pasta or flour. Thank you so much Chef Tess for sharing these amazing ideas. We have been putting off emergency food storage and your blog was just the thing to get us going. We'll be ordering our food and making our meals in the next two weeks. I have a few questions: can the lids be reused for dry canning multiple times? I saw that they could go from dry canning to wet canning, but what about dry to dry? Is there a way to know when not to reuse the lids? Thanks!!! Thank you so very much for all you do! I want to prepare foods like this mainly because I have lost my job before and been unprepared. My hubby loves fresh prepared food and so do I but experience has taught me this among many lessons. This I feel I can do and have on hand and rotate out because of the shelf life. It will keep and the lack of frequency for "prepared" meals should not upset him. Thank you again and may you and your family always have the light and love of our Father shine upon you. Hi. So glad to find these recipes. I've been wondering how to use some of the long-term storage I've got tucked away. You've inspired me! Thanks for the hard work. I loved watching your videos on you tube when you were with Honeyville. Hopefully you will have time to make independent ones in the near future. I have a question for you. In one of your Honeyville videos, the "Thai Chicken in Spicy Peanut Sauce" you used soy sauce powder. Where would you suggest this item be purchased? I did not see it on their website. Thanks Chef Tess! I just found your blog! I have to say it's a God Send! As a full-time on my feet all day, working wife and Mom,I find myself buying "take out" a lot! It's so expensive! But,I have days where I don't have the energy or time to cook. Thanks again! The only real question I have is, where can I get oxygen absorbers from ? I've helped with wet canning before, but I've never tried dry canning. Is your cookbook available yet? Where can I get it? Thanks Chef Tess! I just found your blog. I'm new to prepping. With me being a full-time working (on my feet all day) Wife and Mom.I buy take out food often. It's expensive, and not very nutritious. Your Meal's in a Jar, is exactly what I need! I have a question for you, where can I get oxygen absorbers from? Obviously they absorb moisture, but what are they? Is your cookbook available for purchase yet? Where can I get it? Thanks again! Bless you!